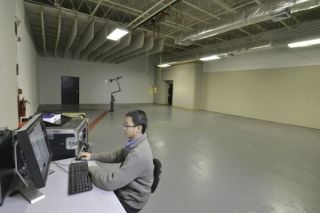 Hadi Sumoro at Community's New Loudspeaker Test Facility. Community has opened a new, state-of-the-art indoor test facility at its factory in Chester, PA. Designed by Charlie Hughes of Excelsior Audio and operated by Senior Measurement Technician, Hadi Sumoro, the new test facility enables loudspeaker measurements with unprecedented accuracy and precision, the company says. With its indoor location, the new facility makes it possible to control temperature and humidity. It eliminates wind problems and minimizes interference from outside noise sources. This allows Community engineers to accurately measure complex loudspeaker data and to gather polar data in precise 1-degree resolution. Measurements are automated with an ELF robotic rotator system controlled by EASERA software. The new test facility follows in the footsteps of a long tradition of loudspeaker measurements at Community. Community’s first test facility was a 32-foot-high tower built in 1975 on a southeast Pennsylvania hilltop which provided measurements that closely corresponded to anechoic chamber standards and established Community as an early leader in providing accurate loudspeaker specifications. In 1981, Community built a semi-anechoic room in its factory to manually collect spherical propagation data of loudspeakers using Time Delay Spectrometry (TDS) technology developed by Richard Heyser and Gerald Stanley. In 1994, Community built a new outdoor test facility extending from the third floor of its factory building in Chester. At 40 feet above the ground and with a microphone to loudspeaker distance of 39 feet, this system is still utilized today and uses TDS software to collect far-field and free-space data and to minimize outdoor noise and reflections. The outdoor test system provides the ability to measure low-frequency loudspeakers in near-free-space conditions.